I was only twelve years old when I begged my mother to let me start shaving my legs. She said I was too young, I whined and pleaded, and ultimately, she sat me on a folding chair in the backyard and slathered my legs with Nair. Goodbye, old friend. I know you'll be shaving armpits in heaven. 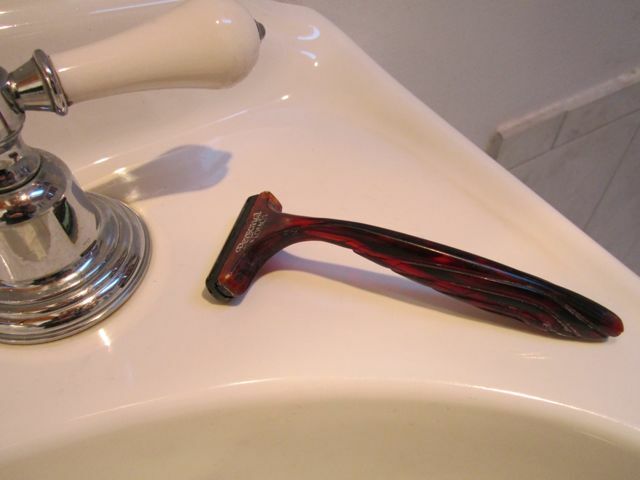 Ten years later, when I lost my razor, I was disappointed to learn that Personal Touch had replaced the yellow-flecked brown of the faux tortoise shell with a more uniformly-colored plain brown plastic. But what that second razor lacked in style, it made up for in reliability, lasting me all the way from my early 20’s up until this morning. And it still works just fine. The sad thing is, I can’t find blades for it because they stopped making Personal Touch razors about five or six years ago. Much like that episode of Seinfeld where Elaine stockpiles boxes of the discontinued Today Sponge, I hoarded my finite supply of Personal Touch razor blades for years. Then, when my stash ran out, I bought them on eBay. And then that just got crazy. Or, I guess, crazier. 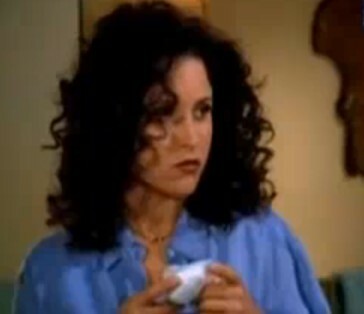 Elaine contemplates her date's spongeworthiness. So last week, I finally caved in and bought a slick, overly packaged mega-blade monstrosity, but only because it promised to give me creamy-smooth legs like J-Lo. Which means I’m officially saying goodbye to my Personal Touch razor blade. Goodbye, old friend. I know you’ll be shaving armpits in heaven.